Summer is here and we are just chillin' on this gorgeous holiday weekend. I can't believe how cool and utterly perfect the chill in the air in Maryland is right now. We are normally in the high 90's and maybe even in the triple digits this time of year and the humidity is off the charts--like you could cut it with a butter knife but not this year--YAHOO! For Sunday Supper we are sharing a group of recipes that are refreshing and cool--just like our weather at the moment. I made some quinoa salad this past week and this was our families favorite of the two fruit salads that I made. I like this one too because the dressing is light but the kids like this one because the dressing is creamy. I hope you enjoy this easy and delicious salad. Feel free to experiment with a variety of fruit combinations. I made this again for the 4th and used cherries, blueberries , jicama and kiwi. I also changed the quinoa to a triple combination of red, white and black. I like a salad where the ingredients can be juggled based on what you have at home. This is one of those that allows you to use a variety of your favorite flavor combinations. To find a slew of other COOL desserts, go to the end of this post. 1. Prepare quinoa according to directions on the package. RINSE and rinse and then RINSE again. I rinse my quinoa about 4 times. I even let it sit on the table for a few minutes just to be sure that I get the bitter flavor washed away. 2. Dice, slice, peel, and cube the fruit of your choice. I used for this salad: kiwi, jicama matchsticks, peaches and raspberries. 3. In a small bowl whisk together yogurt and balsamic vinegar. The flavor of the balsamic can also be varied. I think that lemon and lime pair well with the quinoa. 4. 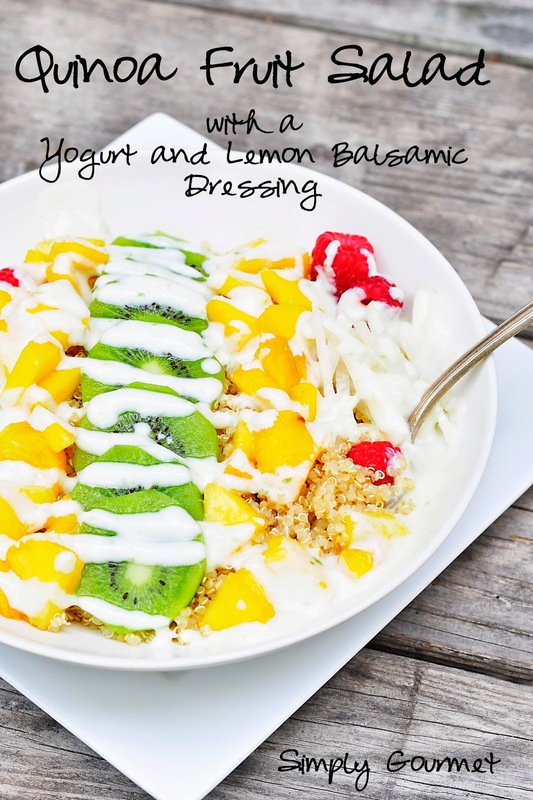 In a medium bowl combine the dressing, quinoa and fruit. TOSS! Taste and adjust the dressing. I like ours to be light enough to see the fruit but my kids thought the opaque version of the dressing was better--LOL You decide. 5. Serve. Keep in refrigerator if not served right away. Mexican Flag Guacamole from What Smells So Good? Dairy Free Lemon Ice Cream from Healthy. Delicious. No-Bake Penuche Drop Cookies from Killer Bunnies, Inc.
C Join the #SundaySupper conversation on twitter on Sunday! We tweet throughout the day and share recipes from all over the world. Our weekly chat starts at 7:00 pm ET. Follow the #SundaySupper hashtag and remember to include it in your tweets to join in the chat. Check out our#SundaySupper Pinterest board for more fabulous recipes and food photos. Would you like to join the Sunday Supper Movement? It’s easy. You can sign up by clicking here—>Sunday Supper Movement. What a gorgeous salad, Sherron! 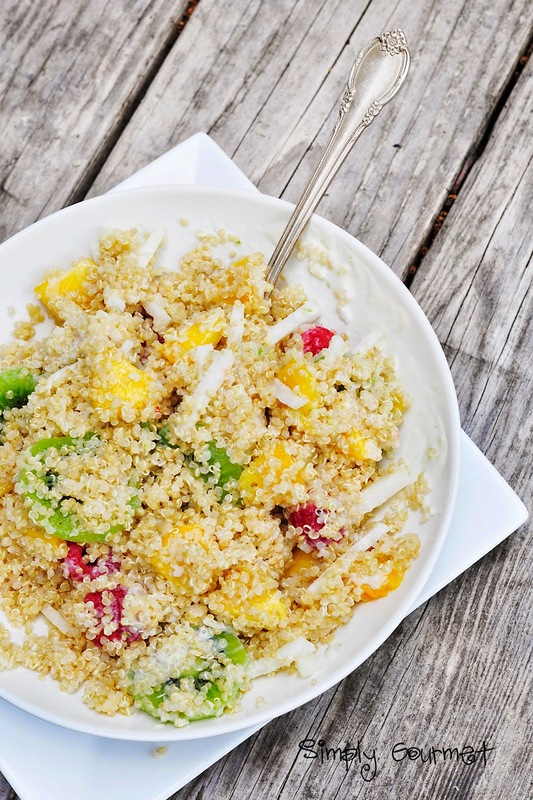 The fruit, quinoa and dressing make for a tasty meal! Thank you Liz. It went pretty fast at the picnic on the 4th of July. You have motivated me to try quinoa again, Sherron. I've made it a few times but, honestly, I still don't understand all the fuss. Your fruit salad looks wonderful and fresh! I agree Stacy and a friend put it to me this way and I really like. He said look at it as texture to your dish not as a flavor component. Once I viewed it from this perspective it helped to use it. I just used it in my meatloaf in place of the oatmeal that I normally use. It was delicious. I hope that helps and good luck with your first dish. Need I just say YUM! What a great way to use quinoa! I love the colors in this salad too! Yum! Thanks Shannon. I liked presenting the salad with the fruit on top first--the dressing, once added, drowns out the pretty colors. That is a fabulous looking salad. I love how versatile it is - nothing better than one of those salads that works no matter what you use in it! Thank you. I like this type of salad too. Thank you. I find the best quality balsamic at the specialty oil and vinegar shops in my city. We have several locations to chose from. This is my idea of a perfect summer lunch! Love the dressing to top it off! Thank you Gwen. The dressing is so good. A nice balance between sweet and twangy. This is such a pretty salad, wow, I love it. The flavors would be amazing together!! So nice for light meal and looks so bright! Thank you Eve. We are trying to switch to lighter meals more and more. What a unique recipe, love it! Thanks Cheryl. I find I am always living out a "chopped" episode as I try to use the ingredients that I have on hand. LOL It does make for some interesting combinations. I just love how colorful and bright this salad it. It's absolutely gorgeous and sounds so tasty! I never think to pair quinoa with fruit, but what a great idea. Thank you Shaina. Sorry for the late reply--I have been dealing with sick kids and then I caught the bug too. There is so many recipes with quinoa but fruit salad? Amazing composition. Fresh, healthy and nutritional! Thank you! I found the combination refreshing and a nice treat. Thanks for letting me know you're a Maryland blogger. I think we're lucky to be here in the metropolitan area where there is so much good, local food and seafood as well. I love the idea for your salad. 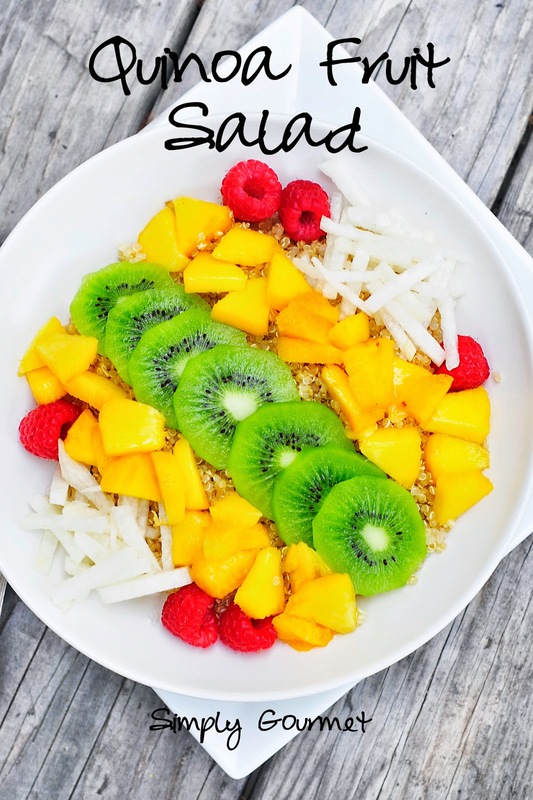 Quinoa is such a versatile grain, and I can totally see it in a fruit salad. Kudos! Thank you Alaiyo for your comment. I agree--seafood in our area is amazing. I could eat it every day. What a gorgeous fruit salad! My kids would dig into this! Thank you Serena. I hope they enjoy the salad. I didn't know they HAD lemon balsamic vinegar! I must get some soon! This fruit salad looks fresh and delcious. Oh we love our flavored balsamic vinegars. Once you get one then you will need them all. LOL I find mine at a local oil and vinegar store--they specialize in high quality products. Enjoy! This is one gorgeous salad and I can't wait to give it a try!! Thanks Bobbi--Have a great week.